At Kitza Tom reported seeing more fish yesterday than he had on previous days and the group of eight rods recorded 58 salmon landed, Richard G was top rod with 12 fish on his card. Tom reckoned that most of the salmon were in the 8lb – 12lb range and straight in from the sea. The water level on Kitza has dropped more slowly than the Varzuga and all beats remain accessible by boat for the moment. ﻿﻿The eight rods on Pana had another bumper day with 139 salmon landed. They are still able to get a boat down to Ponzoi but this option could denied to us in the next few days if we do not get significant rain. It should not matter too much as the most productive beat remains the tail of Lagoon to just below White Rock, so there is masses of room still available if Ponzoi has to be taken out of the rota. The run of salmon continues here at Middle Camp, yesterday we saw numerous pods of silver fish splashing through and our team of 11 landed 126 salmon, the largest of 14 lbs falling to David KW. Ian S is acknowledged by all to be our expert and he is now on 76 salmon for three days fishing – a remarkable effort and most of them caught in “office hours”. Four of our Belgium friends went up Yovas rapids and had a fantastic day up there, Rodolphe C and Dominique C leading the way with 32 fish between them. With three wonderful days of fishing under their belts the team are beginning to experiment, something Hugh and I are encouraging, more single handed rods are being put up, the Bombers and Skaters are coming out and I’m sure that we will have more converts to surface fishing this week. ﻿Those of us who stayed on the lower beats yesterday got together for one of Jemima’s famous roast chicken picnics at Peartiha. 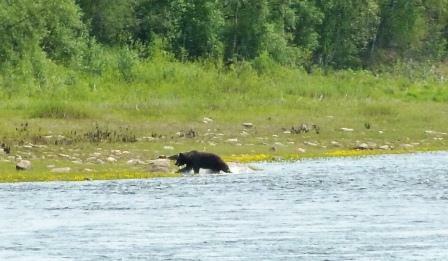 Half way through lunch a bear swam the river right in front of us, a wonderful sight. At Kitza the rods were surprised to see an elk charging across the river with a young bear in hot pursuit. It rained heavily all night and the river is up an inch this morning. A welcome rise, not so much from a fishing point of view but it does help from a boating perspective. In any event the river is a good deal higher than this time last year and is about as perfect a height as one could wish for. ﻿ The water remains at 15⁰C – very much a floating line temperature, the flies of choice at the moment are Flame Thrower, Mediator and Red Francis on a ½” tube or #8 to #10.